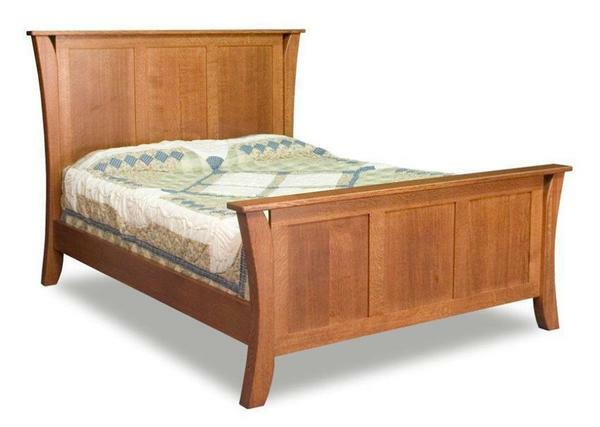 With beautiful paneling to show off the solid wood you select, the Amish Caledonia Shaker Panel Bed offers a unique style for your bedroom furniture collection. Select this shaker bed for your master bedroom or guest room and display the solid construction and charm of shaker style furniture. The Caledonia features flowing curved lines that will create a peaceful oasis in your bedroom. The Caledonia Shaker headboard and footboard both have three reverse panels, curved posts with cutouts and a 1" thick top with a mission edge. This bed has a simple, smooth look that our customers love. The Caledonia is shown here in quarter sawn white oak wood with classic mission stain. Quarter sawn white oak wood displays a distinct grain pattern that is attractive and inviting. The method used to cut the oak log for quarter sawn wood results in solid hardwood that is resistant to cupping or warping, making it a great choice for shaker style furniture and mission style furniture. Shown in Quarter Sawn White Oak with F0814 Classic Mission stain.